This article is about the protagonist in the children's book series of the same name. 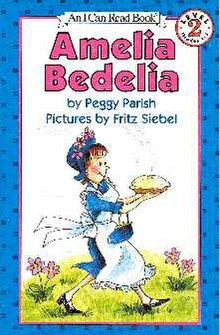 For the first book in the series, see Amelia Bedelia (book). Amelia Bedelia is the protagonist and title character of a series of American children's books written by Peggy Parish until her death in 1988, and by her nephew, Herman Parish, beginning in 1995. They have been illustrated by Wallace Tripp, Fritz Siebel, and the two current illustrators, Lynn Sweat and Lynne Avril. In 1992 HarperCollins republished the three original stories: Amelia Bedelia, Amelia Bedelia and the Surprise Shower, and Thank You, Amelia Bedelia with illustrations by Barbara Siebel Thomas, daughter of the original illustrator Fritz Siebel. 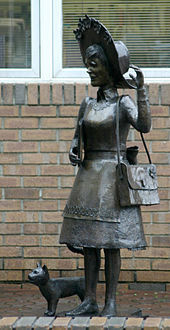 There is a statue of Amelia Bedelia Rogers in Manning, South Carolina, the hometown of Peggy Parish. Many of the books are published as part of the I Can Read! series, levels 1 and 2. The stories involve Amelia Bedelia Rogers repeatedly misunderstanding various commands of her employer by always taking figures of speech and various terminology literally, causing her to perform incorrect actions with a comical effect. Part of her insight into literalism is that she comes from a family who takes everything literally: their method of ridding their house of dust is to "undust the furniture." However, she almost always manages to win everyone over at the end by baking a delicious pie or cake. Much of her employment is as a maid for a wealthy couple known as the Rogers, who are astute enough to realize her literalism and write their requests as "undust the furniture" and "put the wet towels in the laundry and replace them with clean dry ones," as opposed to simply "change the towels." Following Parish's death, children would send in fan letters asking about the continuation of the book series. Herman Parish, her nephew, felt uncomfortable to let her work to be continued by someone not in the family. He then undertook authorship in 1995 with the full support of his family. In 2009, Herman Parish began writing books about Amelia Bedelia's own childhood experiences, starting with Amelia Bedelia's First Day of School. Several theatre productions have been produced based on the series, including by the Serendipity Theatre Company in West Hollywood, California in 1994, the Omaha Theater for Young People in 2001, the San Diego Junior Theatre in 2002, the SCERA Theatre in Orem, Utah in 2008, and the Art Centre Theatre in Plano, Texas in 2011. Universal Studios and Playtone partners Tom Hanks and Gary Goetzman reportedly bought the rights to produce a live-action feature film adaptation of Amelia Bedelia in 2005, but the project never materialized. ^ "HarperCollins Children's: Meet Amelia Bedelia. Retrieved June 16, 2010". Harpercollinschildrens.com. 2010-05-27. Retrieved 2013-04-14. ^ "I Can Read! Amelia Bedelia". Harper Collins. Archived from the original on 2013-06-25. Retrieved 24 June 2013. ^ "HarperCollins Children's: Meet Amelia Bedelia". www.harpercollinschildrens.com. Retrieved 2016-11-20. ^ Meeks, Christopher (29 March 1994). "Review: Amelia Bedelia". Variety. Retrieved 11 June 2013. ^ TheaterMania.com. "Come Back, Amelia Bedelia". Retrieved 11 June 2013. ^ San Diego Junior Theatre. "Shows: 2001-2002: Come Back, Amelia Bedelia". Archived from the original on 20 June 2013. Retrieved 11 June 2013. ^ Pugmire, Genelle (12 March 2008). "Stage review: 'Amelia Bedelia' will delight kids". Deseret News. Retrieved 11 June 2013. ^ Dallas News. "The Art Centre Theatre presents Amelia Bedelia". Retrieved 11 June 2013. ^ Variety staff (21 April 2005). "'Amelia Bedelia' coming to big screen". Variety. Retrieved 24 June 2013.